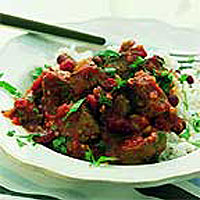 This hearty dish for winter days is flavoured with chilli to add a little extra heat. It also uses Lo Salt, which tastes the same as salt, but is low in sodium. Heat the oil in a large casserole pan and brown the diced beef on a medium heat for 3-4 minutes. Do this in batches. Return all the meat to the pan and add the onion, garlic and chillies. Cook for 5 minutes, or until the onions have softened. Lower the heat and add the beef stock, chilli powder and tomatoes. Cover tightly and simmer on the lowest heat for 1 hour or until the meat is tender. Add the beans and vinegar, and season to taste. Cook for a further 5 minutes until piping hot. Stir in the herbs then divide between plates and serve with boiled rice. This dish will freeze for up to 2 months. Defrost thoroughly and reheat until piping hot. Wash hands, cooking equipment and work surfaces thoroughly after handling raw meat.